For me, if there was one thing I could not live without in terms of makeup it would have to be concealer. Ok make it two things, lipstick and concealer! When I look back at old pictures I always wonder why I thought it was ok to just not wear concealer! Many people use concealer just to cover areas they need to for an everyday look rather than do a base or foundation routine. Concealer is a great product to ‘conceal’ breakouts, hide dark circles and to brighten certain areas of your face. Just like my base or foundation I like my concealer to be lightweight but still do it’s job. I prefer to use just once concealer rather than use one concealer to cover up, one to brighten etc. I also like my concealer to be long lasting! 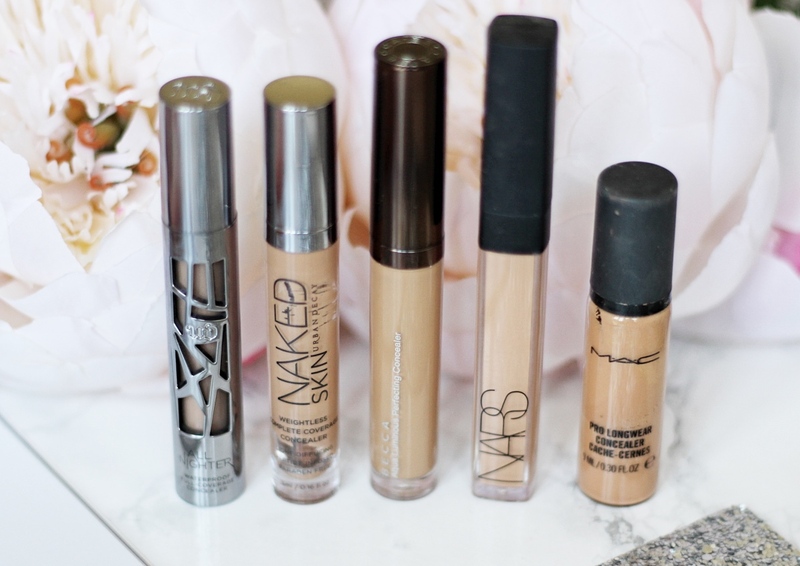 So with all that said here are the best concealers for me, my top five favourite concealers, which tick all the boxes. 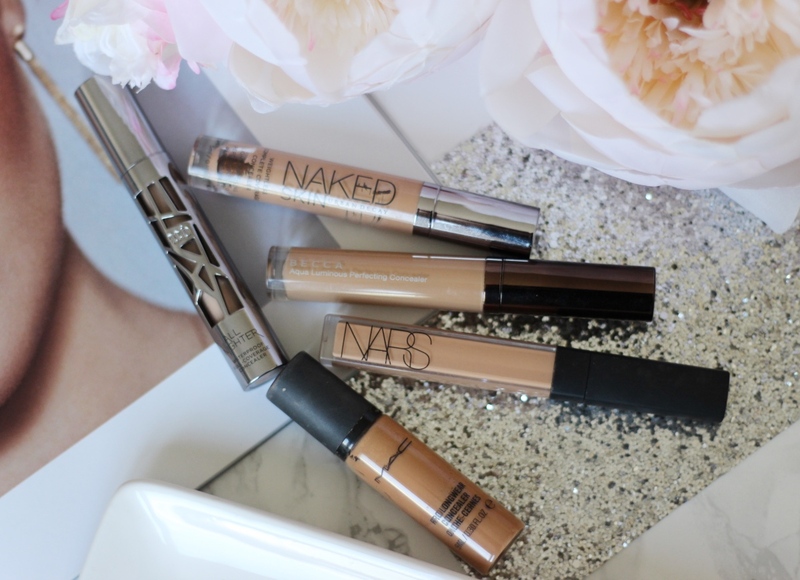 Starting with the Urban Decay Nakedskin concealer. I have spoken about this before and you would have seen it in so many tutorials because I absolutely love it! It’s looks so natural like I’m wearing nothing, it’s so lightweight. I do use it with a peach colour corrector to cover my dark circles and blend out with a beauty blender. I use the shade medium-dark, warm. It brightens my the area under my eyes and lasts all do without looking cakey. The Becca Luminous aqua perfecting concealer is very very similar in terms of consistency and how it wears. I use the shade tan. You can see my very recent and full review here. The NARS Radiant Creamy concealer is a cult favourite. It’s a fab concealer! I did a full review a while back which you can see here because I do still think it’s fab! I love how well it conceals and brightens at the same time. I don’t use this to cover blemishes though because it highlights and makes them stand out more. I don’t use this as an everyday concealer as it is a little more full coverage, which is great but not for everyday. I use the shade Barcelona. The MAC pro longwear concealer has a very similar to the NARS Radiant Creamy concealer but I’d say it’s a little more full coverage. I love how well this blends and if you set it correctly with a small amount of powder and setting spray it won’t crease. I use the shade NC42. This is a makeup artist favourite and it’s a classic! The shade range is absolutely huge! Finally there’s the Urban Decay All Nighter concealer which is in a league all on its own. I have done a full review and demo here and generally I have talked about this concealer a lot! It’s amazing! It’s full coverage but feels so lightweight and honestly it covers everything! I use the shade medium-dark neutral, the shades do come up a little different to the Nakedskin range so I definitely recommend getting colour matched.